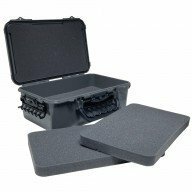 Available in the Classic Stowaway 3700 footprint the 147050 Video / camera case is a must have to protect your expensive photography gear. This Box is fully airtight and water proof thanks to a Full-Length DriLoc seal running around the rim of the lid. The lid is held secure by very strong cam latches and carriage is made easy thanks to a comfortable molded plastic handle. A slip resistant rubber pad helps stop things from moving around inside and the pluckable inner foam makes it easy to custom fit your sensitive electronics or other fragile or expensive items.